Art = Life at R.L. Delight Fine Art: Charcoal! We finally started charcoal this week. Even so, we didn't just jump in with full out charcoal techniques. The first day we got to produce a picture with just two tones, lights and darks. I didn't post it because it looks quite abstract. Thursday they allowed us another tone. With a light, medium, and dark tone, the picture begins to take on more of a realistic shape. We have been promised an increase in tone allowance as we get better. The master teacher commented that we all had made his day at the end of this one. Drawing with charcoal is much different than graphite. 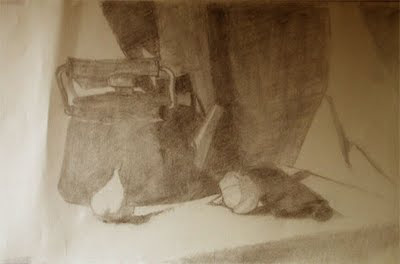 Composing and rendering in charcoal is much closer to painting than drawing. They have also removed some of our scaffolding as good teachers will. We no longer set up a "box" to use as a guideline to draw our pictures. I was surprised to find that I did fine without the training wheels. Two more weeks before the end of this term and we break for the winter holiday. My, time flies when you are learning a lot! Finally, a good deep clear picture! ;-) Looks like you are really moving right along in mediums and technique. I'm sure it doesn't always feel that way though. I'm sorry to see the art school move, but I am sure Portland will be fun and interesting and certainly has much more to offer than Ashland. You asked about the cold...well..you guys have been getting that freezing fog thing, we've been sunny up here. It's going to change though, we'll all be rather cold! But down in the valley, not so much. I would imagine you'll have mostly high 30's and 40's and we'll be mostly 20's and low 30's. I have to say that it's so fun to watch your progress!!! I had a crazy week last week and am just getting a chance to look at your work with charcoal. As a person who struggles with values (the color kind! ), this exercise seems really useful and really hard at the same time. It's interesting that they started with just 2 tones, then moved up to 3. Congrats on almost being done with your first semester!!! I hope you get a nice break to rejuvenate!! Thanks for the encouraging comments as always. It was 9 degrees here this morning but hopefully we will be warming up to above freezing soon! This week they added another twist and I will have the results (hopefully) this weekend. Sue, they start us off with two tones and then add more values to get us used to the technique which is used in painting. I am slowly getting the hang of it but it is a struggle. At least I am not alone. Everyone struggles. It is part of the learning process!